New Delhi: Food inflation shot up to 14.55% for the first week of November, fuelled by higher prices of staple items such as potatoes, onions and pulses. Food inflation had been 13.68% for the week ended 31 October. Analysts expect prices to remain high, unless the rabi winter crops are abundant. 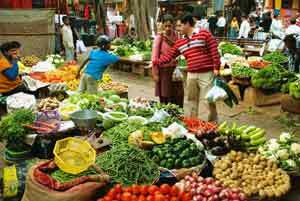 “Food inflation is likely to remain high, unless prospects of rabi are known. It is a matter of concern," Crisil Ltd principal economist D.K. Joshi said. However, he added that high onion and potato prices may be seasonal. There is no item on the list mentioned in the data that has shown a declining trend on a yearly basis.On a weekly basis, though, prices of fruits fell by 1.3%, and that of jowar and poultry chicken by 1% each. Urad, mutton, moong, condiments and spices, barley, wheat and bajra rose 3% each and milk, gram, river fish and eggs by 1% each. Non-food articles inflation also rose to 0.59% from -0.17% a week earlier and the rate of the price rise in fuel, power, light and lubricants was higher at -1.51% compared with -1.71%.